Boris Johnson has weighed heavily into the British general election campaign as the final furlong approaches. His most notable appearance was alongside prime minister David Cameron in support of the Conservative Party’s drive to win seats in London. Now that Cameron has said he will only serve one more term if re-elected, Johnson has an opportunity to talk publicly about his eventual premiership ambitions without appearing disloyal. Not that Boris’s ambitions have ever really been a secret. He has dropped hints that he sees himself as a figure in the mould of Winston Churchill. His biggest clue is his book about Churchill, generally reviewed as being full of rhetorical flourish, but low on substance. But some comparisons are valid. Churchill’s mother was American and Johnson was born in the US. Johnson is hoping to be returned to the House of Commons as MP for Uxbridge and South Ruislip, having abandoned his previous seat at Henley-on-Thames in 2008 to take up the post of mayor of London. Churchill likewise decamped between seats in north-west England, Scotland and Essex. Both figures have been seen as pursuing their own personal ambitions, sometimes at the expense of their colleagues. The Conservative chief whip wished that he could stir Churchill up to hit his opponents “half as hard as he hits his friends”. Churchill was also criticised for lacking “a proper note of sincerity” – a charge similar to that levied against Johnson when campaigning for the mayoralty. Churchill was not even consistently loyal to one party. He left the Conservatives for the Liberals and later went back to the Conservatives. 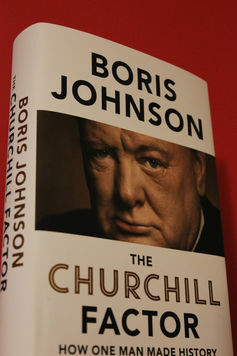 It might be argued, though, that Johnson should be comparing himself not with Churchill, but with Churchill’s predecessor as prime minister, Neville Chamberlain. Chamberlain was a hard-working loyal party figure. He represented his home city of Birmingham throughout his unbroken parliamentary career, having founded his reputation on municipal administration, including town planning and health. Within two weeks of his appointment as cabinet minister with the health portfolio in 1924, Chamberlain proposed 25 pieces of legislation, 21 of which had been enacted by the time he left office in 1929. Here, Johnson could eventually lay claim to a similar reputation, but much of the work of the London mayor only bears fruit after the incumbent has left office. This has had advantages for Johnson. 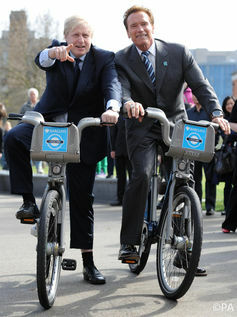 The Boris Bike cycle hire scheme was actually started by his predecessor as mayor, Ken Livingstone. Likewise, the scheme for using pre-paid Oyster cards to travel on London transport. The 2012 Olympics may have been hosted under Johnson’s tenure but they were planned under Livingtsone’s administration. Some of Johnson’s projects, such as the cable car across the Thames, have been designed and implemented during his term of office, but compared to Livingstone’s time, few large new initiatives have been started. Several, schemes, such as the bendy buses and the extension to Livingstone’s congestion charge scheme, have been cancelled. The biggest single project literally in the pipeline now is Crossrail, (also started before Johnson became mayor), but if Johnson gets his wish to return to the House of Commons he will be long gone before the system is fully operational. Fight them on the Southbank? There are dangers for Johnson in modelling himself on Churchill. Both Chamberlain and Churchill served as peacetime and wartime prime ministers, but Churchill’s success came in war, not peacetime. He thrived on war and even went as far as describing the World War I as “delicious”. Chamberlain’s peacetime work is a more relevant model for the current political situation. He never lost an election as party leader. He did not fight one because of the outbreak of war, but historians consider that he would have won a peacetime election held in 1940. Before the war Chamberlain’s approval ratings reached 80%. Churchill’s electoral record, however, was patchy. He failed to win a seat in five of the 21 contests which he fought, and as party leader he never led his party to win the most votes in an election. Despite this, he served as prime minister of three very different governments. He took over the premiership from Chamberlain without an election in 1940. He led a two-month caretaker government at the end of the war. He then lost the 1945 and 1950 elections. Even after his one victory, with more seats but fewer votes than Labour in 1951, Churchill called on the Liberals to form a coalition. They declined. So for all his reverence, Johnson may now want to start distancing himself from the Churchill image now that he can start getting serious about his bid for Number 10.